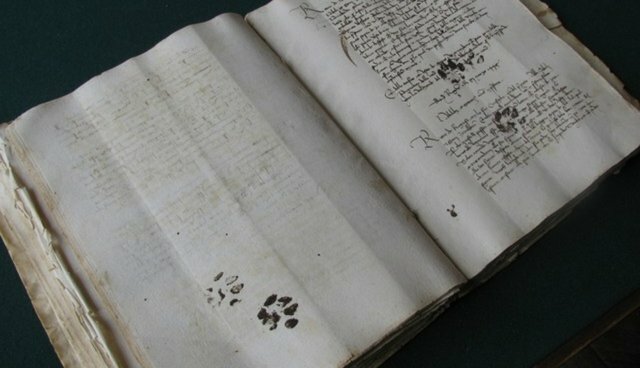 The photo of the cat paw prints represents one such situation which forces the historian to take his eyes from the text for a moment, to pause and to recreate in his mind the incident when a cat, presumably owned by the scribe, pounced first on the ink container and then on the book, branding it for the ensuing centuries. You can almost picture the writer shooing the cat in a panicky fashion while trying to remove it from his desk. Despite his best efforts the damage was already complete and there was nothing else he could have done but turn a new leaf and continue his job. In that way this little episode was ‘archived' in history.